Danielle Ondarza plays the french horn in the band. The group played songs from the artist Johannes Brahms and discussed what the importance of each instrument was. Elizabeth Wilson plays the viloin while U-Jung Jung (CQ) plays the piano during the performance. We learned that the music sheets are not the same for eats instrament player so they have to be able to see each other to know the right timing of the notes. In was the first performance as a trio, The Chamber Ensemble/ Horn Trio, which is a mixture of the french horn, violin, and piano, played a celebration of life and death in a sorrowful symphony. The Thursday Concert was held in the music 3400 building instead of the performing arts building. “This piece was written following the death of his mother. Some scholars believe it was written as a requiem for his mother,” Ondarza said. The trio performed a four-movement piece by Brahms. The piece is called Horn Trio in E Flat Major, Op. 40. 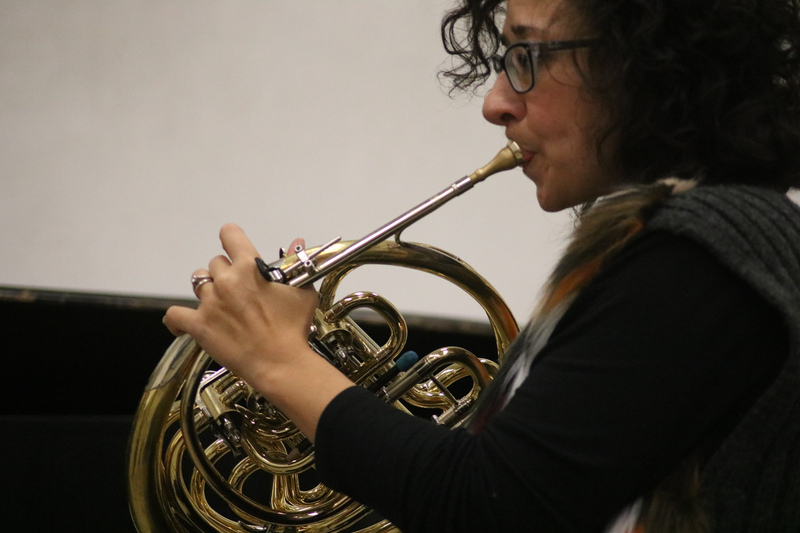 Before the concert began, Dr. Garineh-Avakian, instructor of music, instructed the audience to hold their applause until the end of the performance. Later, Elizabeth Wilson, the violinist, explains it is for the sake of continuity. The applause would detract from the musical piece as a whole. Wilson said the violin is the most voice-like instrument in the strings group, while the French horn is the most voice-like in the brass group. 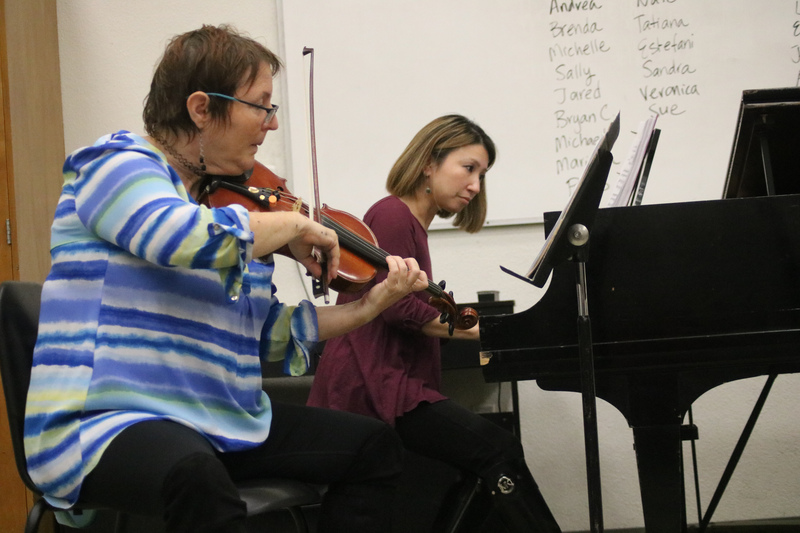 “Each instrument is just as important as the next,” Wilson said. The horn trio began playing the first movement of the composition, Andante. The group had few gaps in the music as they became more comfortable with one another and the audience. The next movement, Scherzo: Allegro was more lively than the previous movement. After it ended the trio took a short break for the French horn player to rest her lips. Ondarza took the opportunity to clean her horn. She explained when her hot breath meets the cold metal horn, condensation forms and accumulates. U-Jung Jung, the pianist, joked and said Ondarza’s explanation wasn’t accurate. “I feel like that’s a cover-up, for it really actually is spit,” Jung said. Wilson said the audience is just as much a part of the performance as the musicians. She explained that the musicians can sense when an audience is not fully engaged or is distracted. The trio began the third movement Adagio: Mesto. This movement had a solemn sound with deeper, drawn-out notes. The transition to the fourth movement Finale: Allegro Con Brio was smooth and quick. It is as if it was one extended movement, rather than one. This movement was bright and cheerful. All in all, the horn trio brought great energy to the Performing Arts Hill.